All Mika Stillwater wants to do is finish this finicky, delicate job, get paid, and maybe, just maybe, get some sleep. That doesn’t seem like such a huge request, does it? After all, if she can finish the delicate crystal vials for that grumpy, obnoxious healer apprentice Althea Stoneward, she will be that much closer to blowing off her dreary Jones and Sons Quarry job and opening her own shop. Just twelve little vials, and all of her dreams will have their true beginning. Really. It wasn’t that much to ask. However, if wishes were horses, beggars would ride. And Mika’s wishes are shattered, in more ways than one, when a baby gargoyle slams into her life. Literally. Now, Mika must decide between fulfilling her dreams or saving a clutch of baby gargoyles from true evil. What’s a girl to do? Why, saddle up and ride to the rescue! I have been fortunate lately to read a few books that have impressed me in their portrayal of strong women characters, and this is one of them. Mika doesn’t have any illusions about her powers making her Superwoman. Instead, she is modest almost to a fault, realizing her boundaries and working hard to move herself beyond them. She is kind and honorable, willing to do what has to be done, even if it destroys her own dreams, just because it is right. Ms. Chastain’s world-building is beautifully wrought and believable within its context, and left me wanting to learn more about the world in which Mika lives. The characters are well drawn, and pace and context well designed. There is no ‘romance’ to the book, this is straight fantasy, and well worth the read. 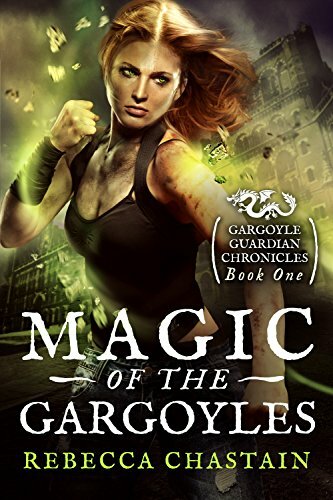 The next book in the series is “Curse of the Gargoyles” and I already have it downloaded through Kindle Unlimited to my tablet. The third book in the series, “Secret of the Gargoyles” is in print now. I have been a reader all my life. My favorite reads are Urban Fantasy, Paranormal and Suspense, especially when they feature strong female characters and action. I still get into a lot of other genres, but everyone has a favorite child, even if they don’t want to admit it, right? As an Indie Editor I am here to help writers reach their goals by helping them develop books that are clean, well edited and a pleasure to read. If you would like for me to look over your book, please drop me an email at Leiah@SoIReadThisBookToday.com. My schedule if flexible, and my rates are quite reasonable! I have been a quilter for years, and absolutely love doing home renovation – not something I can do very well any more, but hey, at least I got that stupid fan up! I love animals, the environment and food. I have a big garden to supplement my organic purchases, and eat a lot of greens! Technically, I have a Masters Degree in Forensics and a Bachelors in Math (neither of which I utilize, fancy that) as well as a Bachelors in English Literature from long ago in a land far, far away. But hey, if I can get this editing and reviewing off the ground, at least I will be using that one! This one is already on my tbr list. It just moved up a bit. It is cute. I would call it ‘light fantasy’ with a good moral code and strong female characters. Let me know what you think! The Case of the Disappearing Blogger!